Tiny Arcade – Mr. Arcade is here! When I was pretty little, I think seven or eight years old, Coleco came out with some tabletop (handheld) video games that resembled their arcade countertop in form if not in gameplay. These were hot stuff in 82, when some of the best portable games were yo-yos. As most small children did (and still do), I watched Saturday morning cartoons. Mine were way better than the swill they heap on the poor kids today, and so were the commercials. One of my favorite commercials was the one by Coleco (You can watch below) for their tabletop arcade games. In this commercial a character, who I don’t think ever showed up again in the pop lexicon, Mr. Arcade uses magic power to shrink arcade games to tabletop size… Even Donkey Kong! This thing is one word… RAD. I got the Ms. Pac Man on Amazon for $15, but they make Galaxian, Pac Man, Dig Dug, Frogger, Space Invaders, and Galaga as well. 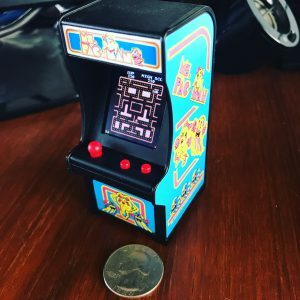 Ms. Pac Man is essentially a perfect tiny replica of the arcade cabinet that you might still find at your local taco or pizza place. The marquee even lights up to add to the authenticity. Beyond the form, the gameplay is EXACT. It’s probably an emulation of the original arcade hardware on a one inch screen. And that’s the caveat, this is literally a ONE inch screen. It’s hard to see and at first I thought I wouldn’t actually be able to play this thing. I was wrong. I’ve been playing Ms. Pac Man on a ONE INCH SCREEN every day and liking it. Yes, it’s hard to see, yes, the joystick is less than perfect so I sometimes die when I don’t want to, but honestly even arcade versions in arcades have little problems that we all overlook (like some are set way too fast) in order to play this all time classic. I’ll probably loose my 20/20 vision from eye strain, but I love playing this thing. I seriously think any of these is a perfect gift for the retro gamer in your family or friend circle. There is one weird thing, SI put a keychain ring on this thing… Why? Why does everyone put a keychain on everything that’s small? Do keychains add validity to small products? I dunno, I think it’s weird to put a keychain option on an otherwise perfect product. Don’t forget to watch Mr. Arcade below!